I have purchased shift boots from Redline Goods (www.redlinegoods.com) in the past for other cars and was bummed when I looked for Lotus products there- they didn't have any patterns for the Elise. I emailed Maciek, the owner, and was able to send him my old boot and some measurements for the parking brake a few weeks ago and installed his new pieces last week. They can do custom leather and thread colors, all boots are made to order- no interest or affiliation, just a satisfied customer. I do not believe they have updated the website to include Lotus yet but soon, the prices are typically very competitive, they are based in Poland. I also installed the Lotus shift plate I purchased from another EliseTalker, it required adjustment of the shifter location and I also used a Dremel to reshape the opening so that there was zero contact between the shifter and the plate. I also put together a write up for the DIY R&R : http://www.billswebspace.com/Install...gBrakeBoot.htm . Last edited by wrh3; 02-27-2007 at 08:57 PM. Looks good. How bad of a price for both boots? Too bad no one makes a slotted shift gate for the Elise yet. I know, kind of a PITA some times to shift, but it sure looks sweet. Thanks, If pricing is consistent with VW pieces, it will probably be around $40 for each or $60 for both. I'm not sure the gated shifter would work in the Elise because of the way the reverse cable would get in the way, this interference and other contact were the reason I "modified" the piece I had. 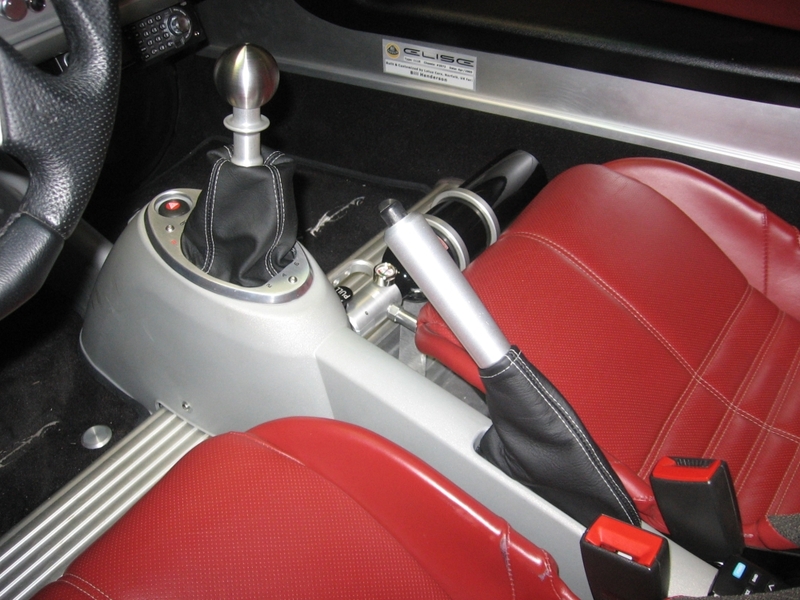 I assume the e-brake boot requires a custom center console cover, kina' like the one sold by HRM? Where did you get the aluminum trim piece from? No, I just tucked the excess down around the e-brake while the console was lifted up (two screws removed) and then tightened it back down. I had to play with it a little to get it the way I wanted it and so it would stay tucked but it's been a while and no issues. I bought it from a fellow EliseTalker who didn't want to use it, I believe it is available as a Lotus accessory packaged with a shift knob and a parking brake handle. I did something similar with a old boot from an Acura Integra I had lying around. Its more temporary until I can get something nice like you have. I just didn't like the look of that metal piece. i need a e brake boot as well!!!! How much is the Lotus parking brake boot? Got mine from my mom who is office manager at Star Motor Cars in Houston so I didn't ask the price. It sure looks nice in my car though! Looking for a replacement Elige now! FYI, I'm ordering the sample set of all the leather colors...I'm hoping to find one that goes better with the biscuit interior. Once I'm done with the set, I'd be happy to send it on to another E'talker, just PM me if interested. The intent of this post is not to bash AGLA but rather to offer my opinion for others EliseTalk members to consider. I bought their Lotus Hand Brake Cover and was disappointed. My reply to an email from AGLA is shown below but I have yet to receive a response despite four months passing. I've attached a picture that I believe is worth a thousand words. One correction to my email below: AGLA does include instructions which I found as I was throwing out the paper envelope that my cover arrived in. than the tan one I ordered on the phone. impression was to ignore it based on my previous experience. while the sides sometimes lift up and over the center console opening. Overall, the boot is too short at the rear and on the sides. lacking in product & customer service qualities. Have a glorious new year. The pricing I listed earlier is accurate and the RedlineGoods.com website now list our application. ew man that looks gross ... well i called my lotus dealer...they said they can get me one for 35 bucks...they said its from the lotuses before 2005? I have several brake boots in stock. Perforated black leather to match your shift boot. Made by Lotus in the UK. how does it look inside of the vehicle?